All welcome, no experience necessary….just for fun! The studio is part of Inspire up the stairs to the right of the main Inspire building – ask at reception if you can’t find it. Levenshulme people fought to save our library and we will have a new library in 2015 as well as a lifelong learning centre and support facility for pupils run by Levenshulme High School in the current building. An amazing future for libraries and learning in Levenshulme. Interesting article in The Guardian yesterday, “A library is not just about books: it’s also a place for the vulnerable”, available HERE. 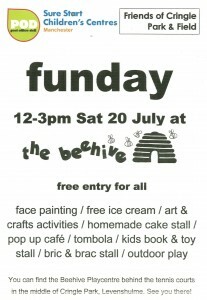 Wondering what to do in Levenshulme during the school holidays? The Arcadia Sports Centre will be open every day from 12.00 – 16.00 for the kids throughout the summer holidays. There will be football, roller skating, roller hockey, roller derby & martial arts. Full details and a programme will be posted when they are available or keep an eye on the Arcadia website HERE. If you know any older residents on your street, please call and see they are ok in the heat. HERE (pdf download) is some guidance – from Western Australia – for looking after older people in a heat wave (it will help little ones keep cool as well!). HERE is the advice from NHS Choices. From September 2013, Levenhulme High School will be working towards becoming the first school in Manchester to be ‘officially’ LGBT friendly! The school will be working with Elly Barnes’ Educate and Celebrate programme. Elly has devoted her career to helping schools become environments in which LGBT students and teachers can thrive without fear of discrimination. “We want as many schools as possible to tackle LGBT equality, we want every student to be proud of who they are. Educate and Celebrate is not just about fighting prejudice it’s about celebration” Yvette Cooper MP, Shadow Home Secretary and Minister for Women and Equalities. Play that funky music, DJ! Levenshulme Youth Project & ALL FM have come together to offer MC, presenting and DJ experience. Are you 13 – 17 years old? Or do you have a teenager in your house with a whole summer looming and not much to do? Come to ALLFM. Learn to MC, Present your own radio show or even lay down some original tracks. Join us from Monday 29th of July to Friday 2nd of August from 11am – 4pm every day. It’s free and it will be an amazing experience. There are only 12 places so it’s first come first served. Lucy Lloyd-Roach who teaches swimming at Levenshulme Baths has just swum the channel to raise money for the British Heart Foundation. Congratulations, Lucy! In yet another stunning success for Levenshulme the Beehive Play Centre in Cringle Fields Park has been saved from closure. 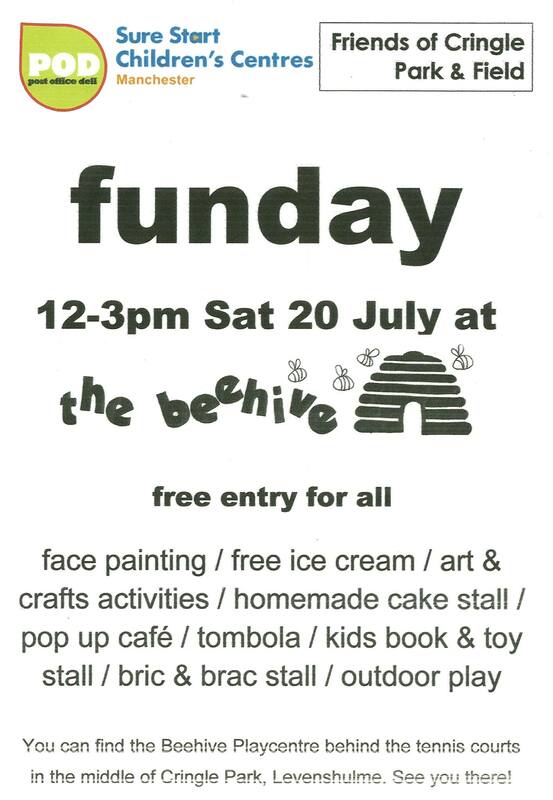 The Beehive Sure Start Play Centre will continue to operate through a partnership with the Friends of Cringle Fields Park. To celebrate this success a Fun Day is being held on Saturday 20th July from 12.00-15.00. The Beehive is behind the tennis courts in the park. Come along, have fun and celebrate! An update from the people at the lovely Levenshulme Market. This shows how much Levenshulme loves its Market. For those who are interested (we accept that you may not find this quite as exciting as we do!) the market on 27th will see the debut of out VERY OWN STALLS – 25 of them to be precise which have been bought with our start up funding from Manchester City Council. Why 25? Well because that’s how many we thought we could sell when we set out our business plan – and we thought that that was optimistic! Little did we know how brilliant the community of stallholders in Levy and Manchester would be at embracing our idea and, since we now have 50 stalls (and loooooooong waiting lists) booked in for every market, Manchester Markets are kindly renting us the additional 25 – but that still costs! And any money that we spend on them gets taken away from the profits we can reinvest into the community. Sooooooo….yesterday we applied for funding from the National Lottery for 25 more stalls of our very own. We think we’ve got a good case so please cross your fingers for us (although these things take time, so apologies if you get cramp). You may also have noticed at the last market that we had a camera man following us around…the lovely Alex Hill – resident, film maker and all round good guy was making some films about the market that will support our funding bids and also explain a bit more about what our social enterprise is all about and how YOU can benefit from it. So it’s exciting times, here at Levy Market – keep your eyes peeled for more info soon!! A lovely article by journalist and Levenshulme resident Ally Fogg in the Guardian about Andy Murray’s win at Wimbledon. (OK, a pretty tenuous link between Levenshulme and Wimbledon but who cares, it’s sunny and someone from the UK has won Wimbledon). After living through the 1996 primary school massacre, Murray’s greatest achievement is giving his town back to its people. Some lovely photographs from the Levenshulme Food and Drink Festival 2013 by photographer Elizabeth Kurtis. Find out a bit more about Elizabeth HERE. Her website is HERE or visit her BLOG. A marvellous Music Hall evening performed by the Levenshulme Singers on 8th June 2013 at the Levenshulme Klondyke Club.